Bill Frisell Trio On JazzSet It's true: Bill Frisell wears glasses, dresses casually and is modest and soft-spoken in person. But instead of stepping into a phone booth to put on a cape, he straps on his trusty Fender Telecaster and strides onstage at the Kennedy Center's Terrace Theater with his trio. 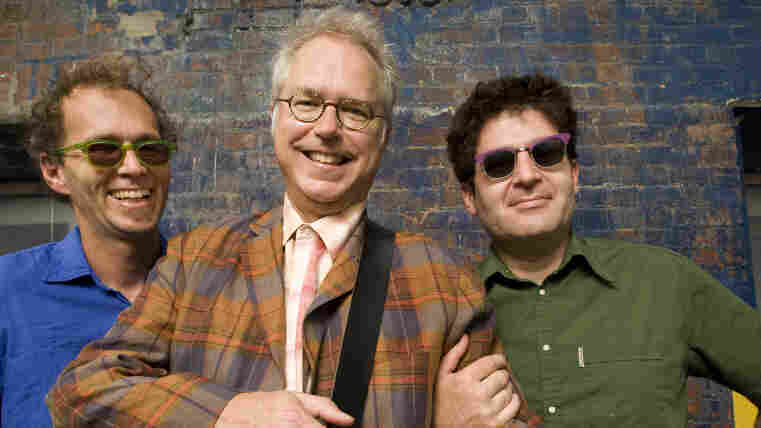 From left to right: Kenny Wollesen, Bill Frisell and Tony Scherr. It's true: Bill Frisell wears glasses, dresses casually and is modest and soft-spoken in person. But instead of stepping into a phone booth to put on a cape, he straps on his trusty Fender Telecaster and strides onstage. Think of Frisell as a master painter who takes traditional American music forms like jazz, blues and folk and melds them into evocative soundscapes. Digging deep into the heart of Americana has been a wellspring of inspiration throughout his career. His recent projects include scoring soundtracks for the films of the great silent-era comedian Buster Keaton. His latest album consists of musical impressions of the photos by the man known as "Disfarmer," a 1940s-era rural Arkansas artist and photographer who took stark black and white portraits of the local townfolk. Frisell describes his trio with Tony Scherr and Kenny Wollesen as "the most flexible, spontaneous group I play with." They don't work from a set list. Frisell plays what he feels at the moment. It could be a familiar jazz standard or a tune from one of his film soundtracks or a honky-tonk melody from a long-forgotten roots musician. The songs evolve organically on the stand. Believe it or not, Frisell plays just one instrument onstage, a Fender Telecaster. But he gets 1,000 different tones and sound effects out of it, thanks to an array of foot pedals and electronic boxes at his feet. As Mike Joyce wrote in The Washington Post about this set, "He often used pedal effects to generate orchestral loops of sound, pinballing backdrops and jarring shifts in dynamics. Yet for all the electronic tweaking, what stood out most was Frisell's inherent fascination with melodic pull ... Frisell is a sucker for enduring folk tunes, romantic pop and jazz lyricism." Surround Sound remix by Duke Markos.